There are few people in the arts who admit to being concerned about either their fame or their place in history. Jaimy Gordon is one of that rare breed, but she doesn't need to fret anymore. Over the past decade, she said in a phone interview last week promoting her April 19 reading at Augustana College, she wondered whether "I was going to be swallowed up in the oblivion of people who are just mildly well-known in their own lifetimes and then forgotten about." Since 1981, she has been on the faculty at Western Michigan University - in a creative-writing program that doesn't have the cachet of, for example, the University of Iowa's. Her 1974 novel Shamp of the City-Solo is considered a cult classic, and her 1999 Bogeywoman was a Los Angeles Times "best book of the year." She had the respect of her peers but said she remained a nonentity in the publishing world. "I had what I would have called a career," she said. "But to my surprise, the New York Times among other places didn't even recognize it as existing. It wasn't even on the map until I suddenly became famous with this book." With her 2010 National Book Award for Lord of Misrule - a novel about low-end thoroughbred horse-racing, informed by her experience as a groom at a racetrack in the late 1960s - Gordon joined the company of such past fiction winners as John Barth, Saul Bellow, John Cheever, Don DeLillo, E.L. Doctorow, Ralph Ellison, William Faulkner, Flannery O'Connor, Joyce Carol Oates, Thomas Pynchon, Philip Roth, and John Updike. You can randomly pick a paragraph and see that Gordon belongs. The book has multiple narrative voices - all filled with gorgeously rendered geographic and occupational dialect - but the most vivid are associated with the track veterans whose minds race with phrases and sentences that are both plain and poetic. "It resembled some woebegone carnival ride, some skeleton of a two-bit ride dreamed up by a dreamer too tired to dream," she writes on the first page, her repetition suggesting a limited vocabulary struggling to express a fanciful idea - and succeeding. The descriptions sound tossed-off and alien but are unerringly accurate: "He was an unhealthy looking man of a drained cement color." That coarse narration is balanced by Gordon's storytelling with the young Maggie - a hack writer caught up in a scheme at the seedy Indian Mound Downs in West Virginia. The language in these sections is more literate but just as kicky and observant; in a parenthetical paragraph, Gordon shows great care even in her digressions: "Anyway there was a kind of spinning emptiness in him where things like sensible fear should be, a living hollow where light was dark." Even this simple sentence revels in language both florid and surgical: "And she winked hideously." And, Gordon said, there were clear parallels between the subject matter and its author's career: "It's a book all about luck, and probably the most interesting characters in the book are the old guys who are beginning to give up, who are on the downslope, who are worrying now about what's going to happen to them in their old age. They don't have children. They've never made it big. They're kind of stuck in that racetrack life. They're looking for one last big killing. That kind of described my situation when I brought this book out." Both literature and horse-racing are outwardly glamorous, she said. But below the publishing luminaries and famous horses are those - many, many more - who toil in relative obscurity. "You make a big bet when you take a career in the arts, and it was just beginning to become clear to me that maybe it was never going to happen for me," Gordon said. "I was not going to command the power to get anything published that I wrote. Ever. And my books might just disappear, the ones that I'd written already. And nobody would be interested in my life or my papers or anything else." She has no children, she added, and "the whole life was built on the presupposition that I would leave behind a monument of work of some kind. And suddenly it looked like that might not be the case." This was a time when it seemed unlikely Lord of Misrule would ever be finished - let alone published. The author had long been interested in horse-racing - she chose Brown over the University of Iowa for her graduate writing program in part because of its proximity to a track - and "I'd been meaning to write it [a horse-racing novel] since I worked at the racetrack." "A Night's Work" was her first stab at it and was featured in the 1995 edition of The Best American Short Stories. That encouraged her to work on the book. "I had in mind to write a social novel ... and write a novel about every quality of person on the racetrack and ... these various levels of society - one lower than the other, because the whole society is five pegs below normal American society." She was most attracted to the older people in her story. "I suddenly felt I could write about aging characters probably better than about the young ones, with more conviction," the 67-year-old said. "I was more interested in them, more sympathetic to their plights. ... I gradually realized: That's because I'm there; that's me." She presented a draft of the book to her agent more than 10 years ago. "I thought I had a commercial book," Gordon said. "She disagreed." The two parted ways, and the novel sat on Gordon's desk. For years. Beyond having difficulty finding a publisher, there were several additional obstacles; both of Gordon's parents died in that decade, and she said she's easily distracted anyway. But the bigger issue was Maggie, the "frizzly hair girl" of Lord of Misrule. "When it came time to go back to work on the book," Gordon said. "I simply couldn't bring myself to, because I was angry that my standard protagonist had crept back into the book - that's a reckless young woman in her mid-20s. I hadn't meant to write about that character this time. She sneaked into the book ... . I couldn't make myself read it." Maggie, she said, was too close to the point-of-view characters from her previous novels - books that didn't connect with audiences at the time. "That impudent, nervy, risk-taking young woman who used to interest me so much, she has not panned out for me," Gordon said. "I was feeling kind of sour on her, just the way you feel sour on a racehorse." And if it weren't for Gordon's longtime publisher and friend Bruce McPherson, Maggie would have probably kept the author from ever returning to Lord of Misrule. "Bruce swears that I gave him permission, that in 2010 in the summer he could have the book if I hadn't sold it elsewhere," she recalled, saying that her husband was also involved in the scheme. "And he suddenly sent me - he's working from an old computer file - the book in galleys. 'Okay, this book is going to be published at the end of August, and I'm entering it for the National Book Award, so we're not fooling around this time. You have to keep your deadlines.' ... I forced myself to go back and read the book. It was a lot better than I remembered. I found my way back into it relatively easily, which doesn't always happen, and I worked on it like crazy for three months." Gordon said she asked for more time, and McPherson refused, saying, "You're going to be a contender for the National Book Award." She said she found the statement "the most far-fetched claim you can imagine. ... This is like some garage band down the street from you trying to get its CD ready for [the Grammys]." McPherson, Gordon said, has "always believed very strongly in my work. But he's an eternal optimist, and famous for publishing rather difficult books that hardly anybody will read." The National Book Award nomination meant that many more people did read Lord of Misrule - the hardcover was published just two days before Gordon won and sold 45,000 copies - and it let the author dream big. She said in an interview in late 2010 with the New York Times - the publication that didn't acknowledge her career previously - that she told McPherson, "What I want right now is to see my book in an airport." "I definitely had that experience," she said last week. "In spades. And don't think I didn't go to check." 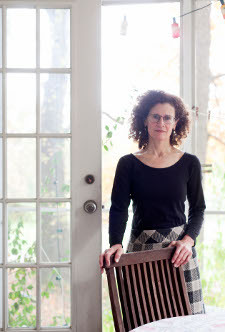 Jaimy Gordon will read from her work on Thursday, April 19, at 7 p.m. at Augustana College's Wallenberg Hall, inside the Denkmann Memorial Building (3520 Seventh Avenue in Rock Island).